This time of year I’m always emotional. I’ve previously complained about my birthday overlap with Mother’s Day and how the weekend is usually not something I’ve ever enjoyed much. But I think that’s done and past. The emotions don’t quite go completely away, but I’ve grown out of my bitterness. The emotions begin on May 7, which is my late Grandpa’s birthday. May was special to him because he received a grandchild on his wedding anniversary (me! ), which was just 3 days after his birthday. Grandma and Grandpa never hid their love for me. They were very verbal about it – especially Grandma. Most of my memories of them are warm and gentle. But there’s a few memories of Grandpa in there that catch my breath and sting a little. My memory of all the details is fuzzy because I was a kid, and honestly, the adults around me talked very little about health concerns (now, for which, I’m glad to have been spared some details). Grandma had beat breast cancer in the 70s, and then again later at some point when I was alive (again, fuzzy). When I was older – early teens – the lymph nodes in her arm began to swell and give her trouble with lymphedema, which was around the same time that I started to recognize behavior changes. Mainly confusion. She lost her nouns first. Then some verbs. I didn’t know much about dementia then, and I still don’t know if she had a proper diagnosis. Before her symptoms were getting worse, Grandma and Grandpa moved across the Indiana border to live in Ohio, closer to my aunt so she could keep an eye on them. As Grandma progressed, they eventually moved from their condo into the house directly across the street from my aunt and uncle. It was sad to see Grandma lose pieces of her vocabulary, but I never felt awkward about it. She was still herself – warm, gentle, loving. Perhaps thankfully, she died of complications other than dementia, so I didn’t see her progress to the late-stages. I’m not sure if Grandpa was starting to demonstrate behavior changes during this time or if it was after Grandma’s death, but life started to get confusing. Dad was always worried about them, and I’m sure he felt like he was further away in distance than actuality. My aunt became caregiver and helped make their lives comfortable. I feel like Grandpa gave up after Grandma was gone. Perhaps it was the stress involved with caring for a spouse, or maybe it was some kind of dementia. 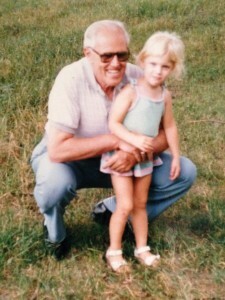 He was never diagnosed, either, that I know – and certainly, he didn’t have the progression that Grandma did. But things changed, and I saw pieces of a different person emerge – and then isolate and withdraw. It was frightening, and I distanced myself away from him, not understanding what a disease can do to a wonderful, great and compassionate mind. It’s only been in the last few years that I have “forgiven” Grandpa for doing things I didn’t approve of and becoming someone not-Grandpa. It came up in conversation today, and my mind was again flooded with angry thoughts from adolescence, but they are only memories of anger. I wish I would have known what I do now about neurological and degenerative diseases. It would have helped me properly say goodbye to my grandparents. I miss them. I miss hearing, “Grandma loves you.” And the older I get, the more I see them in my looks and personality traits. Though neither one had Alzheimer’s disease as an official diagnosis, I am still honoring them each year I participate in the Walk to End Alzheimer’s. When I lead volunteer orientations, I tell others that the Walk is a day of hope. So much distress surrounds Alzheimer’s and dementia, but this is one day that the nation can rally together in hope for a cure. Wouldn’t it be wonderful to have the disease eliminated from this world? Wes would never have to see anyone – let alone his grandparents – go through such a life-changing journey. This year, on Grandpa’s birthday, I understand, and I have hope.